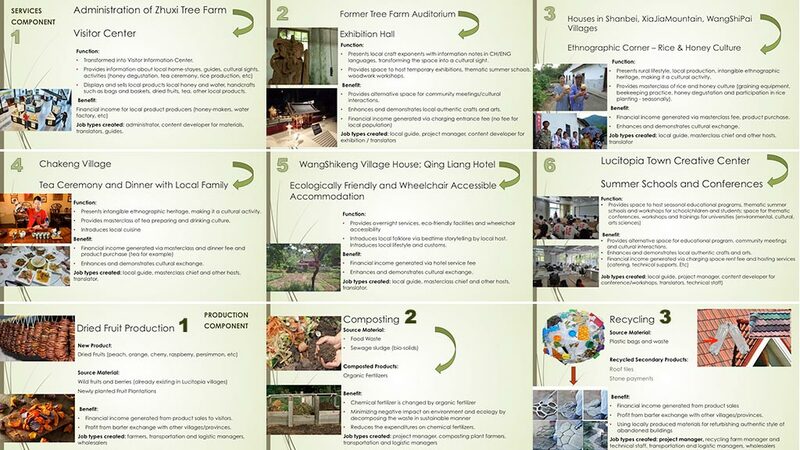 The Lucitopia Rural Design Challenge will take place in Qingliangshan national forest park, Zixi County, in Jiangxi Province, China in May, 2018. 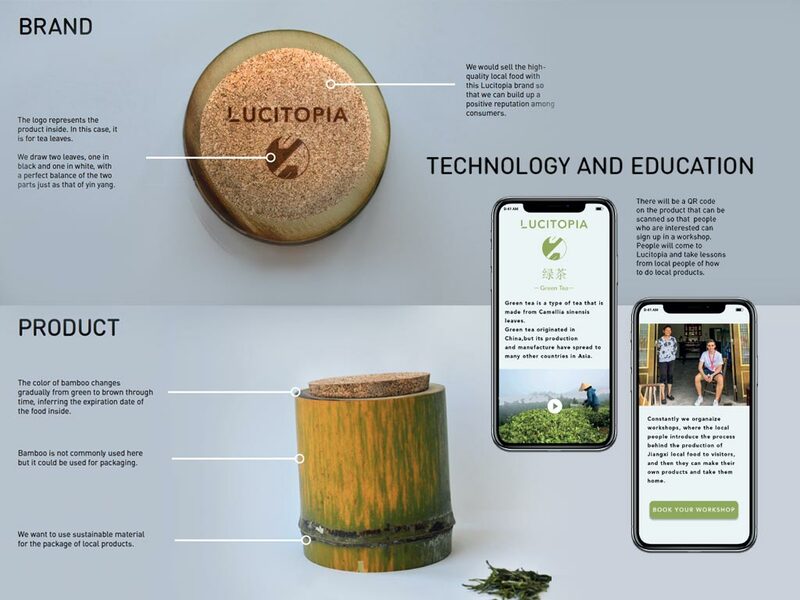 The Challenge marks the start of ‘Lucitopia’, a highly ambitious project, focused around new concepts of rural town building to encompass key values of ecology, economy, society and related industry, agriculture, services, culture and systems. 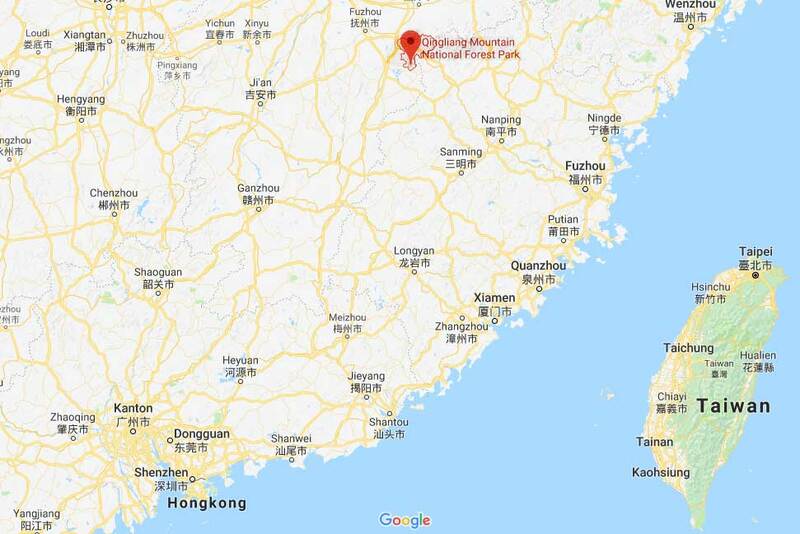 Location of the Challenge in Zixi county, Jiangxi Province, China. 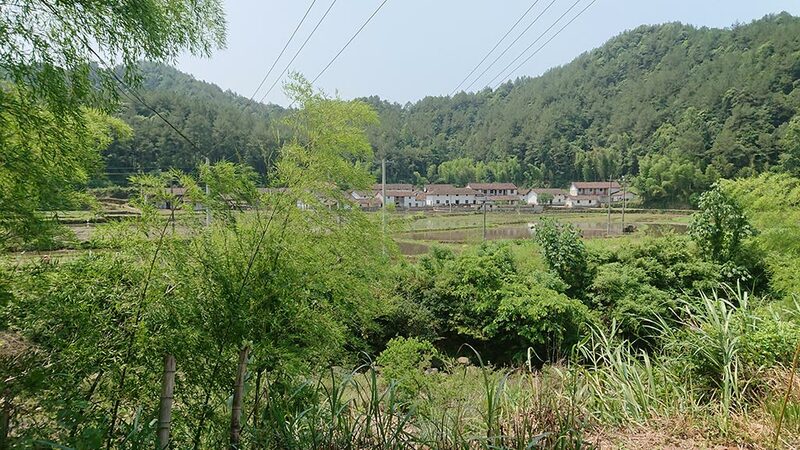 ‘Design and develop a new town and community in Qingliangshan national forest park, based on the organic and balanced unification of “producing (work), living (everyday life) and ecology”, and using the tangible and intangible natural assets and culture of the area. 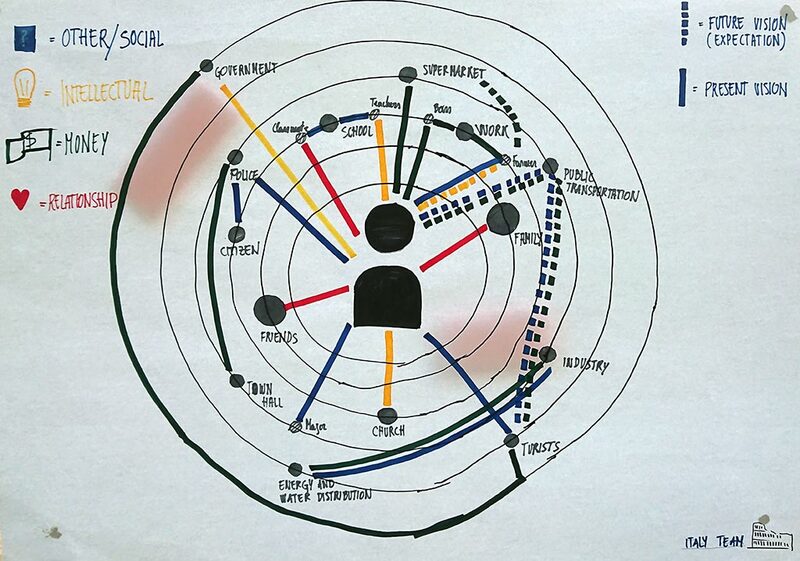 Key elements include Green Industry, Livable ecology, Culture and Art, Community and a Cohesive Operational System. As a means of rural repopulation, this initiative should particularly attract potential residents and visitors who share the same values with regard to life fulfillment in face of the demands of the modern age, and should be designed to be expanded and replicated in other areas’. The LRDC focuses on the Zixi County in Jiangxi province, some six hours by train and road inland from Xiamen in Southern China. 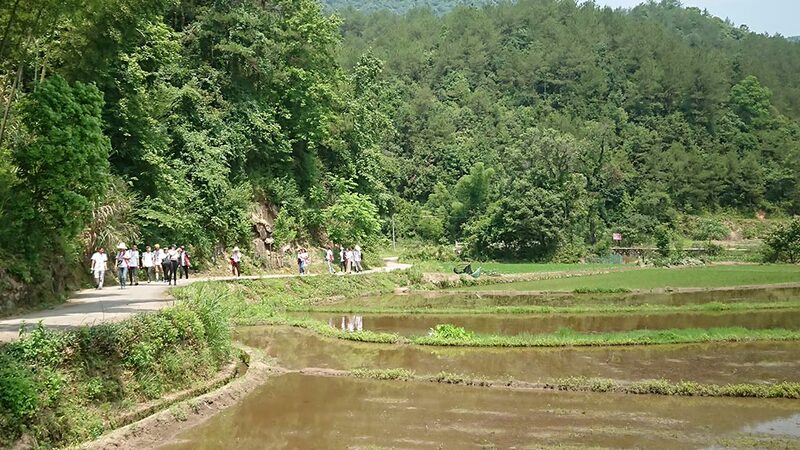 The relative inaccessibility of Zixi county has brought about both disadvantages and benefits: while the area is largely undeveloped, it has maintained an aura of outstanding natural beauty and unspoilt authenticity. The slogan “Pure Zixi” is frequently used by local officials. 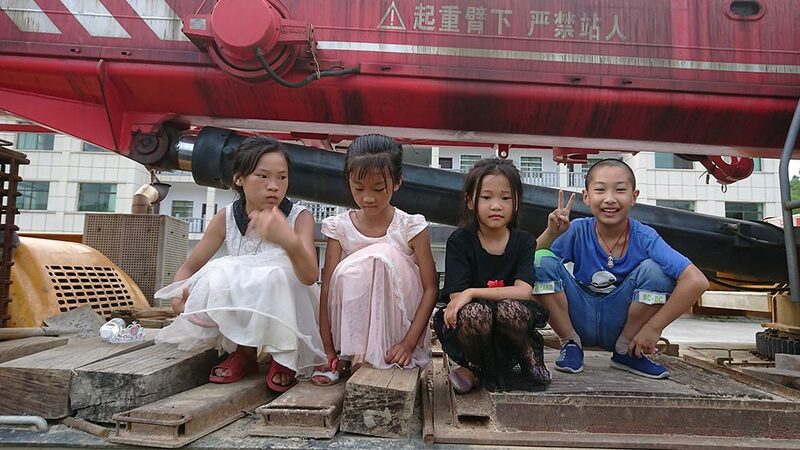 Like many such rural areas in China, and indeed, worldwide, Zixi county has suffered from family fragmentation and depopulation as younger residents left their homes in search of work in the larger urban centres. The population, particularly in the villages, is now composed mainly of older people and some children. 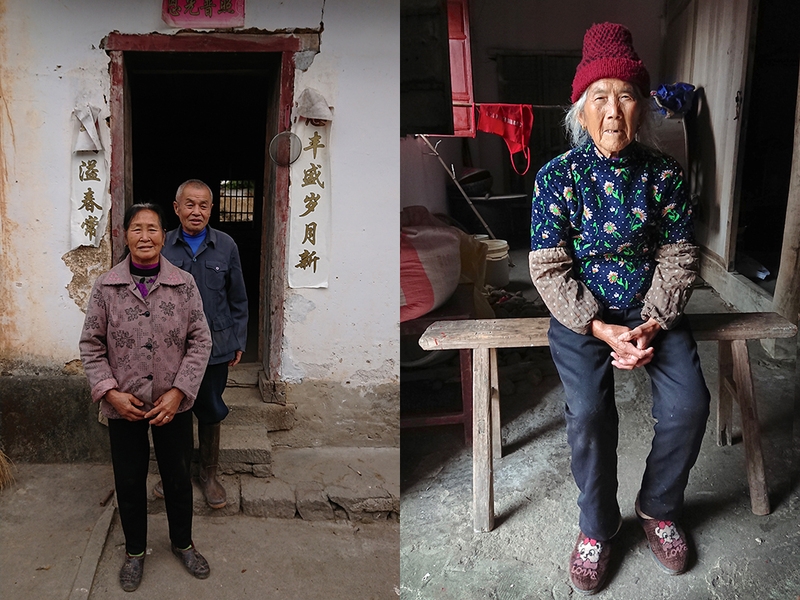 The inhabitants of the area also comprise two different groups: the ‘’originals” with a long local tradition and the “immigrants’, who were moved to the area from Chun’an County in Zhejiang Province in 1959 after the flooding of the area to create the Qiandao Lake. Though both groups of inhabitants are visually strikingly different in their architectural and living styles, they cohabit in a perfectly friendly and supportive way, and are equally affected by the population drain. Most young people have moved to the cities. Right: 王石坑-WangShiKeng Village. Left: 夏家山-XiaJiaMountain Village. On an economic level, Zixi county town has invested in a large nature-focused tourist centre and several museums. 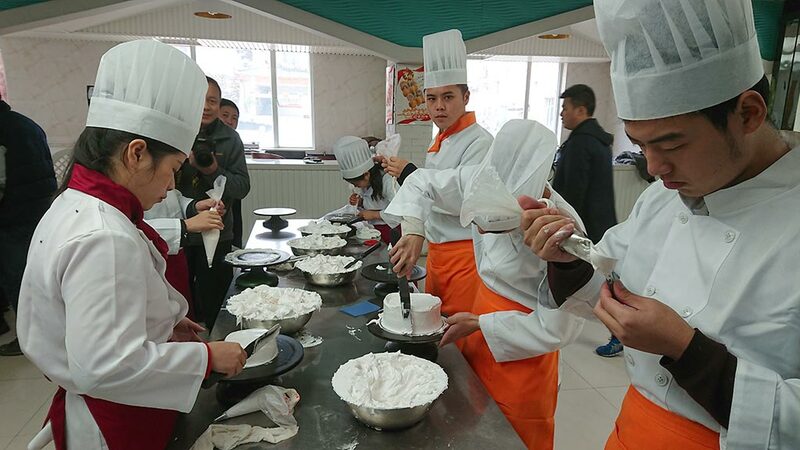 The town is famous for its bakery and confectionary school, which sends high quality bread and highly qualified bakers throughout China. The area also produces high quality tea. Otherwise the village areas are renowned for a very plentiful supply of top quality bamboo, all kinds of organic vegetables and fruit, high quality spring water and delicious honey. 资溪面包文化园-Zixi bread culture park – bakery and confectionary school. Organic vegetables and fruits. 株溪水电站-Zhu Xi Hydropower Station. 王石坑-WangShiKeng Village. 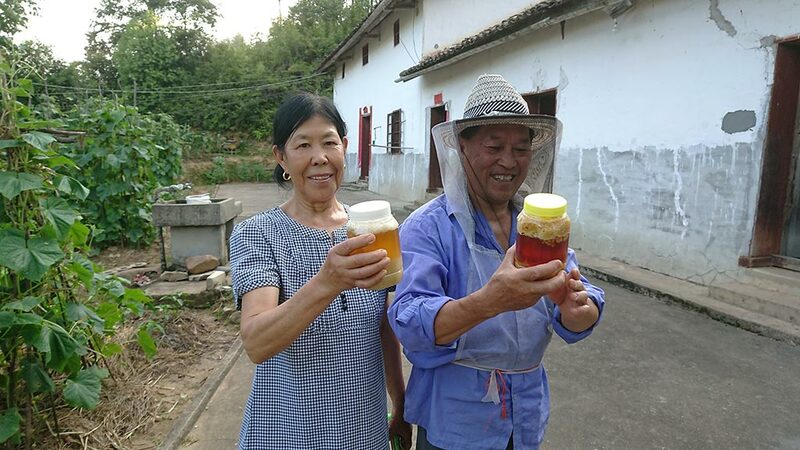 This man produces one of the best honey in the county and proudly shows his queen bee. 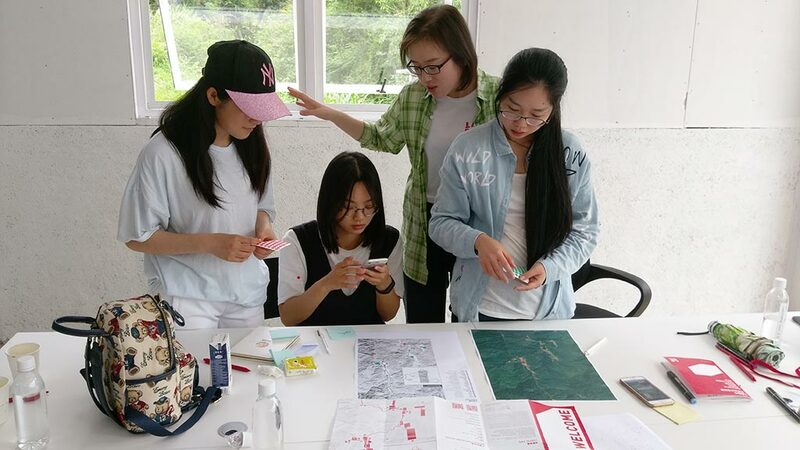 In line with the usual format of the Design Challenge, several teams of design professionals and design students, each team consisting of four members with diverse and complementary skills, will travel from Europe to Zixi County to participate in the event to design solutions for the structure, content, and services of the new town. 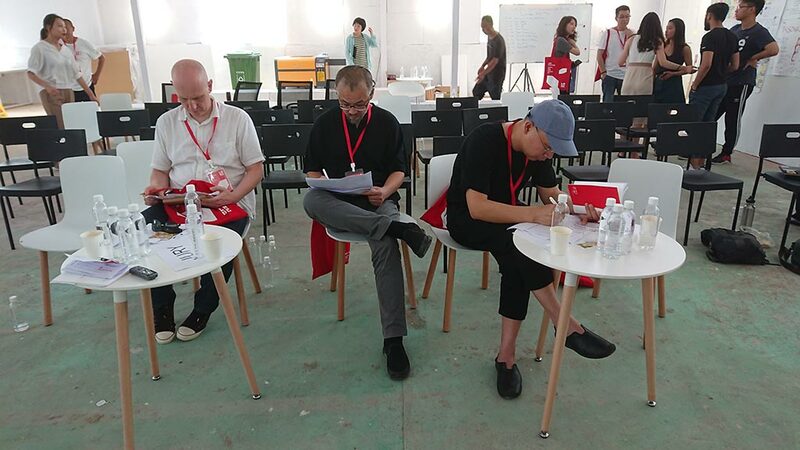 In Zixi, they will also be joined by teams of designers from Hong Kong, Taiwan and mainland China. The dates for the Design Challenge event are from 21st May to 26th May 2018. Participating European teams should schedule the period from 19th May to 28th May in their planning, to include time for travel. CC: Where did the overall Lucitopia project concept originate? ZZ: We developed all of the concepts, methodology, and strategies. 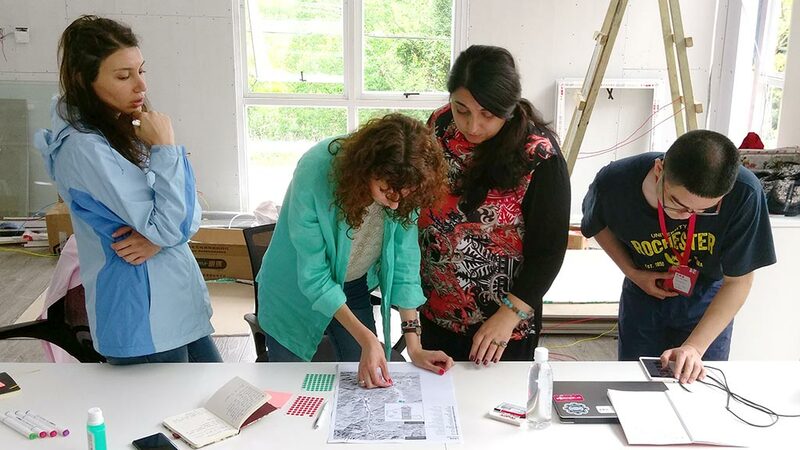 We didn’t start with the idea of developing a town, but rather something small – from the design and creation of the objects, experience and behaviours of people’s everyday life, to a space or an environment in which people are able to experience everything we design for them, from which we had a new focus which was the interaction between people in this environment. Then we started to think about the community and the environment. 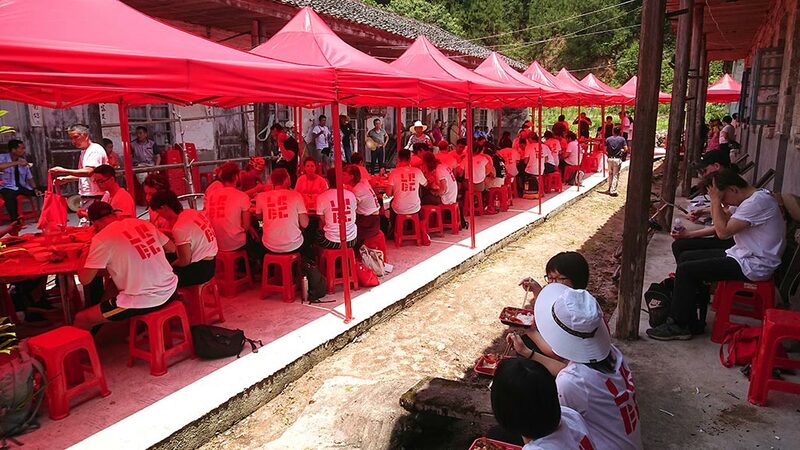 We discovered that what we’ve been looking for in our design for humans is always there in the Chinese rural community and its environment – the warmth, purity, smartness and solidarity of the people and the community, the ecology, the nature, and the way the people co-exist with nature. They have the foundation (resources) to practise some of our ideas, even though they have the disadvantages at the same time (the relative remoteness, de-population, etc.). CC: Why was this approach selected? ZZ: I think the above to an extent provides an explanation of why we used this approach. 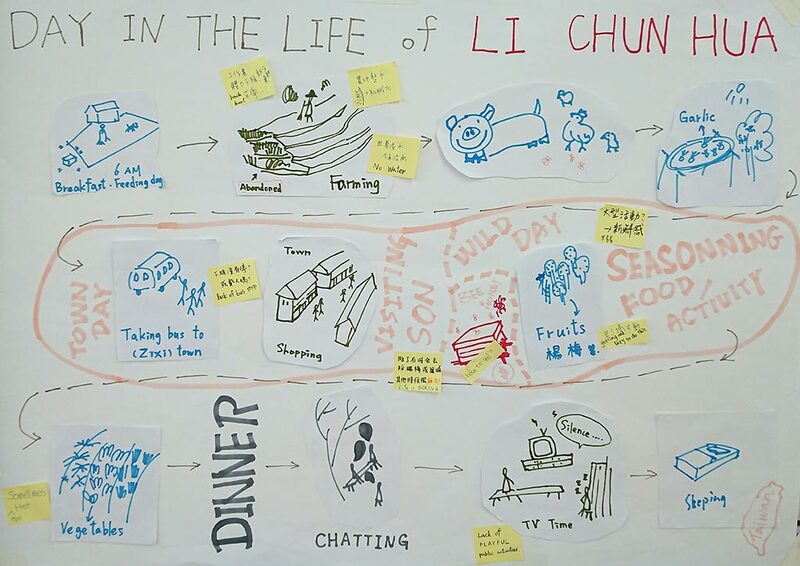 From our side, what we’ve been always interested is to study people: what kind of designs can help them in their everyday life and work, what kind of experience (of maybe simply dining, drinking, playing, etc.) can evoke their deeper emotion, how they interact with their living or working space, how they would behave in their socializing, etc. From the perspective of the local rural area, they have their unique natural, cultural and social resources, but they are confronting de-population, de-vitalization, the loss of identity, and eventually their disappearance. CC: Was this decision influenced by other similar projects? If so, where? ZZ: The above texts describe only the start of the idea. We then needed to do the research and develop the idea in order to bring it into reality. We researched many practices in China and abroad, and there are many developments based on a real estate model, but there are also some inspirational cases, such as the case of Wu zhen in Zhejiang province, which is famous for its international Wu zhen Theater Festival, as well as the later World Internet Conference. Many industries, services, and contents were built around these two big events. Art Setouchi and the Echigo-Tsumari Art Field are two very good examples in Japan that revitalize the de-populated Japanese rural areas through art events. There are more cases I can list, but for us, it’s important to develop our own plan, which suits this specific area. 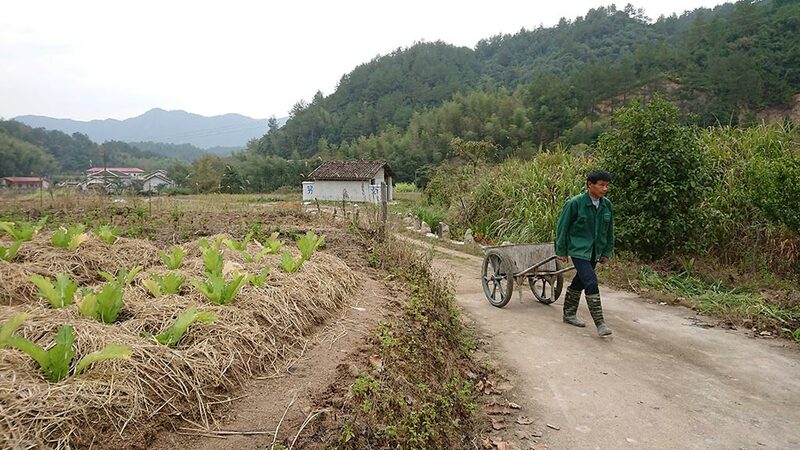 CC: Can you tell us more about Rural Development in China? ZZ: Recently, I’ve seen many discussions about rural development, as well as a relevant government development strategy. The rural area has been treated in a “supporting role” to the urban area for a long time, which means all the resources were allocated to the urban area, until the 19th national congress of the communist part held last year came up with a “strategy of rural revitalization” – the rural area will be more independent, more resources will be reallocated to rural areas. The strategy came after many rural development practices had been undertaken in the past decades, which were generally a kind of “real estate model”. CC: How would you describe the core concept of the Lucitopia project? 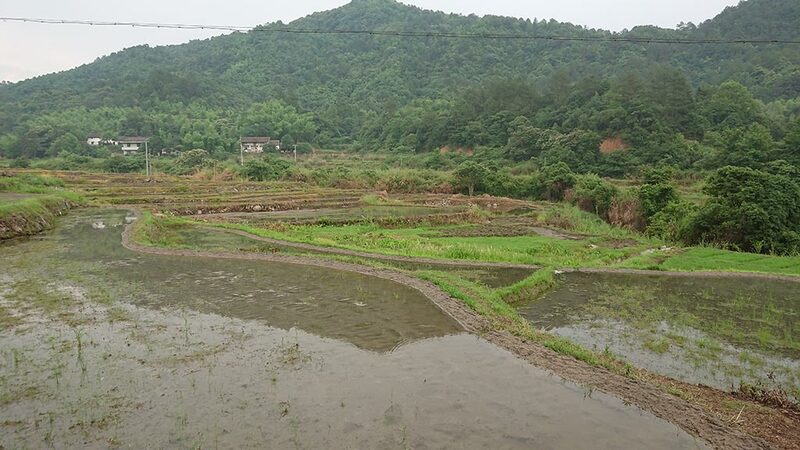 ZZ: This development around Qingliangshan is based on the core concept of “the organic unification” of ecology or environment (E) production (P) and living (L). General planning revolves around five elements: Green Industry (Compound – Industry chain), Liveable Ecology (Resident-Entrepreneur-Tourist co-exist), Culture and Art (Catalyst), Community (Foundation) and Flexible Operational Mechanism (Vitality/Energy of the town). We are dedicated to creating a model of a town, in which the people lead a fulfilled life that meets the human needs in the new age. CC: Why is the project called Lucitopia? ZZ: Qingliangshan Qingliang is a word, comprising two Chinese characters: Qing and Liang. Liang often means “cool”, and Qing could be translated as “refreshing”, so Qingliang could be explained as refreshing and cool. Therefore we think it relates to “Lucid”. It is also a Buddhist term and it has deeper meanings. With Lucitopia, we are describing a utopia, but with a clear shape in a real world. Utopia is symbolic for our town but it’s not just idealism, it ought to work in reality. CC: How does the Design Challenge relate to the whole Lucitopia project? ZZ: The Design Challenge is the first activity in the construction of the camp. 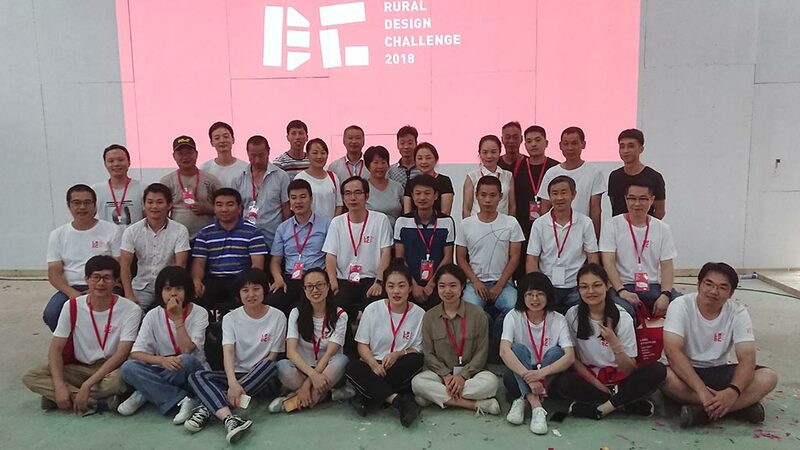 The Challenge will focus on designing community, industry, service and architectural solutions, using materials such as bamboo, wood, pre-fabricated architecture, and electronics. In addition to the design/ fabrication workshops of the design teams, there will also be a large space reserved for presentations, possibly also conferences and exhibitions. 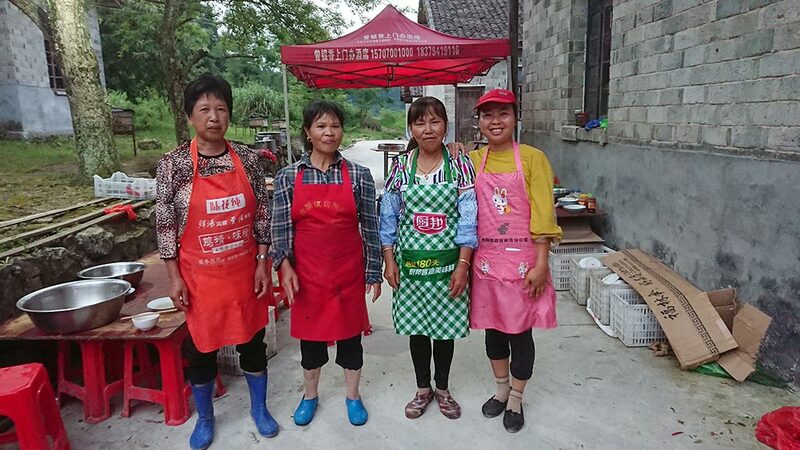 Accommodation is provided and the meals will be mainly prepared outside of Qingliangshan, and will be delivered to the design participants, in order ensure that the food sufficient to host that amount of people. We will also have a headquarters camp and a research and education camp, focusing initially on agriculture and food in the 1st phase. 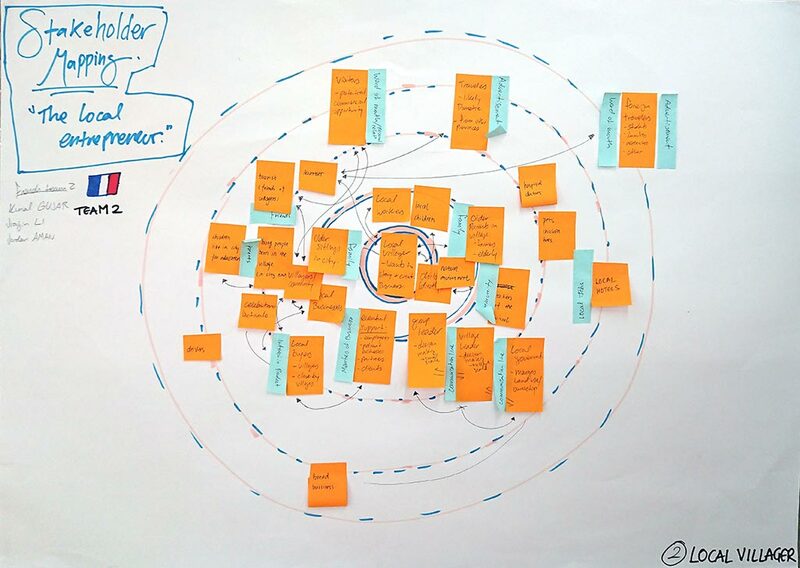 CC: Who are the stakeholders, and how are you cooperating? ZZ: For us, Lucitopia is an eco system that includes everything (concept, culture, industries, contents, events, services etc. ), which we would like to do. 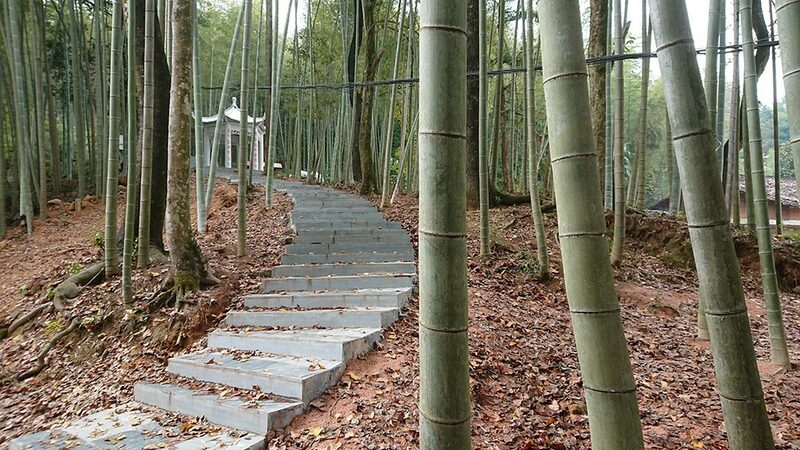 Lucitopia town in Qingliangshan is a physical realisation, which incorporates Lucitopia’s concepts, culture and values. The local rural area is confronting many problems, and we – the stakeholders – are looking for the opportunity to realise our ideas. This is the point where we collaborate with each other. Generally, the county government plays the role of supporting and supervising us in this project in order to revitalize, re-develop and regenerate this rural area. As for other stakeholders, the planned area includes many existing entities – the villages (farmers, their houses, fields, gardens, etc. ), enterprises and businesses (water plant, hotels, restaurant, etc. ), and the parts belonging to the tree farm. It’s very important to cooperate with the all the above-mentioned parties. Methods we could use include creating jobs for the remaining residents, supporting their business activities, bringing the existing businesses together or starting a new one together. However, it could also mean offering to rent or buy their property, if they have moved to other places. CC: Can you give us more practical details on planning and logistics? ZZ: The camp should be completed in plenty of time to meet the planning for the challenge (second half of May), and we’ll need time to test it before the challenge. Researching the area, gaining the knowledge and trust of the local villagers, and an overall impression of local assets and needs. 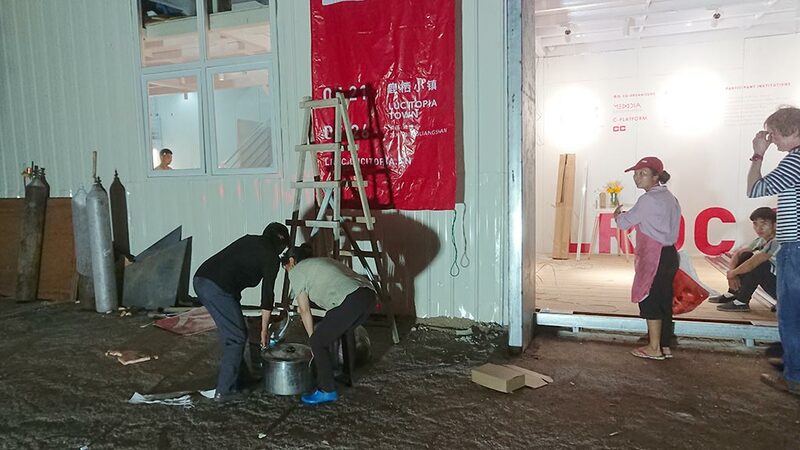 Establishing a base – with a central workspace, ateliers, living containers, all facilities and utilities – in a remote part of China, with very limited infrastructure. Establishing the web sites for the Challenge. 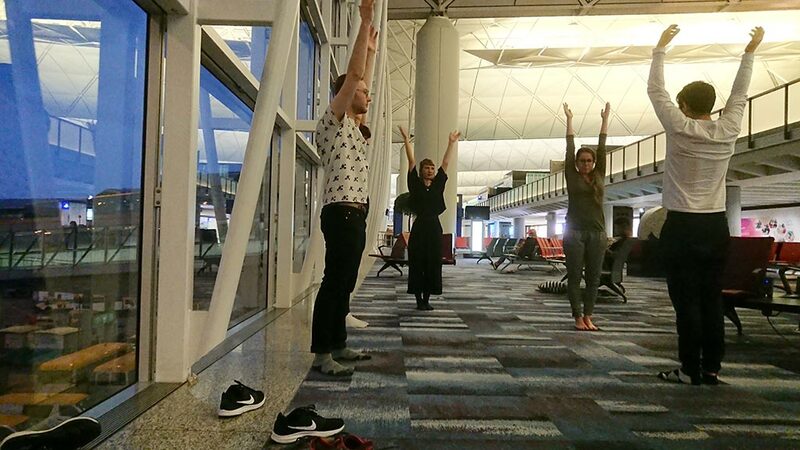 The visa application process itself, with its inevitable, unexpected twists and turns. The journey itself, with its flight cancellations, and hastily rearranged bus and train journeys. 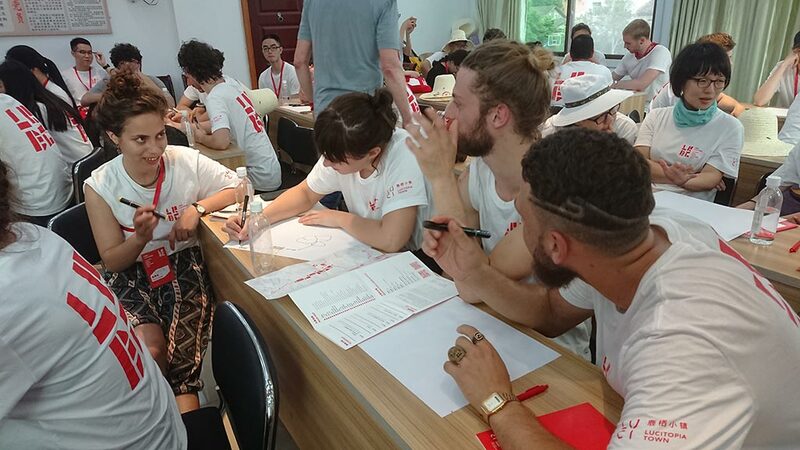 All these preparations finally came to a head on the evening of Sunday, 20th May, when the delayed Dutch team finally joined the other participants in Wu Shi town for a communal meal and night’s rest before the start of the Challenge on the next day. In addition, economic and natural assets were inspected such as the mineral water plant, the Zhu Xi Hydropower Station, the Dam and the Waterfall. 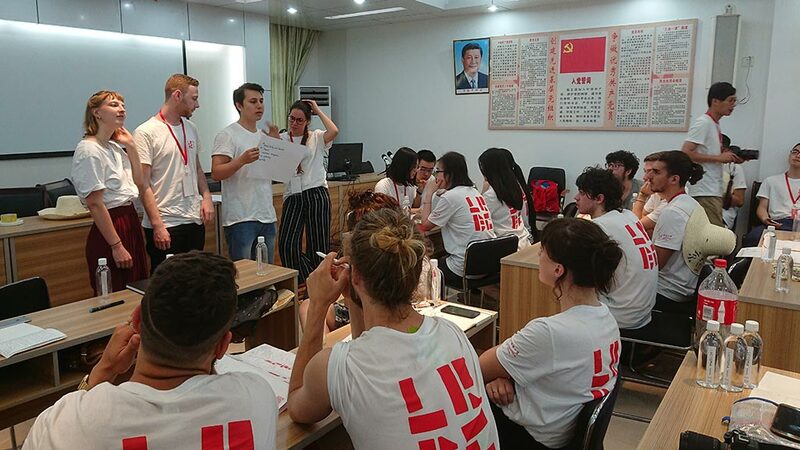 In the late afternoon, the teams mapped and presented their experiences of the first day, before returning for the open air evening meal in the improvised kitchen and LRDC ‘canteen’ along a narrow street of ZhongChen village. 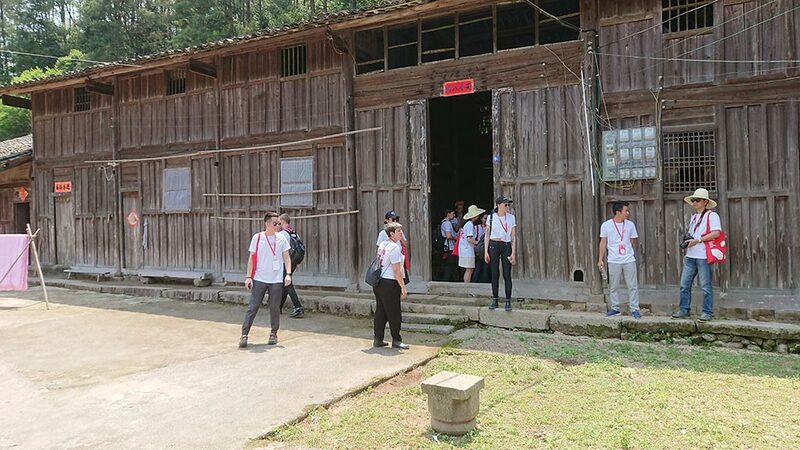 This village had been a former home for the ‘Educated Youth’, young people who left urban centres to live and work in rural areas as part of the “Up to the Mountains Down to the Countryside Movement” at the time of the Cultural Revolution. The village had almost certainly not seen so much activity since those days. 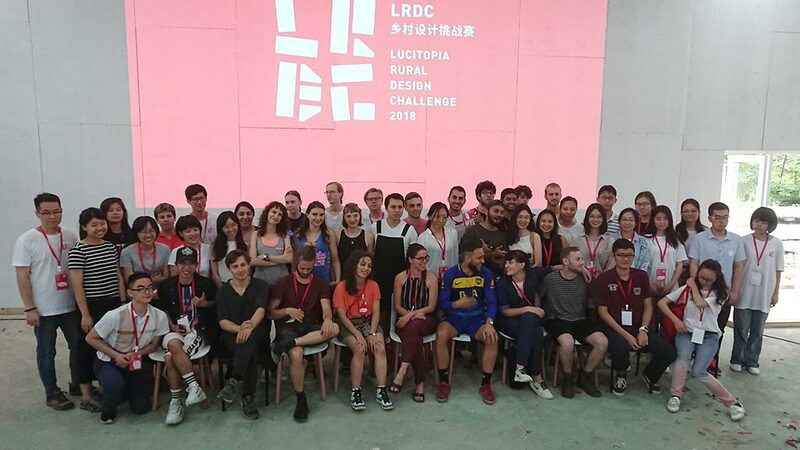 Following lunch, the official opening of the Lucitopia Rural Design Challenge, and, at the same time, the whole Lucitopia Town project, took place. This was an important moment for the Design Challenge, given the amount of preparation and support which had been required for its realisation, and for the Lucitopia Town project as a whole, given that this was the first step in the realisation of a long-term vision. 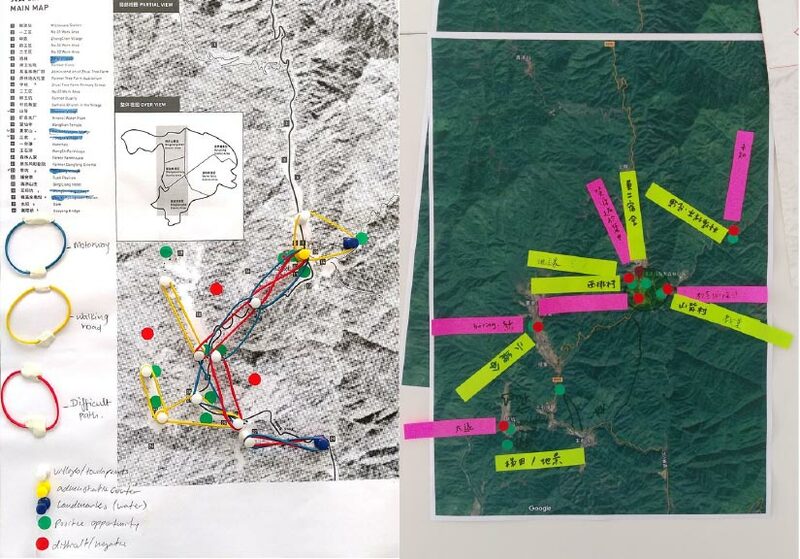 The importance given to the event by local government leaders was witnessed by the presence, among others, of the vice governor of the county and the vice chairman of the People’s Congress in addition to the Tree Farm workers and local residents. 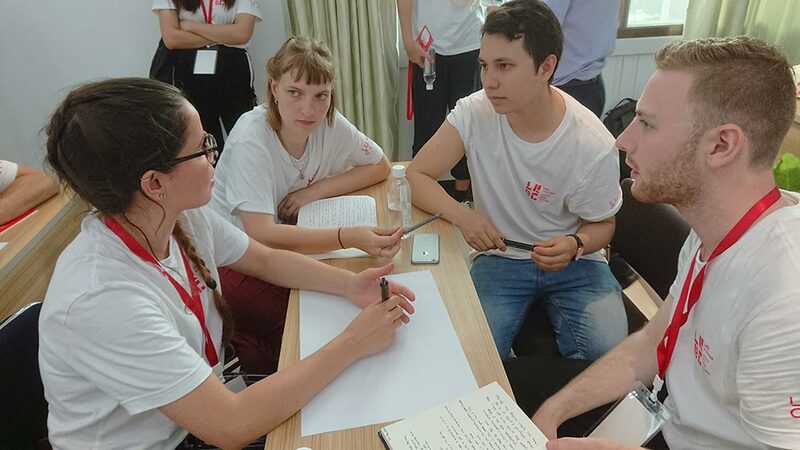 Already at this stage, the individual teams were beginning to focus on particular themes and target groups, with their solutions and proposals in mind. 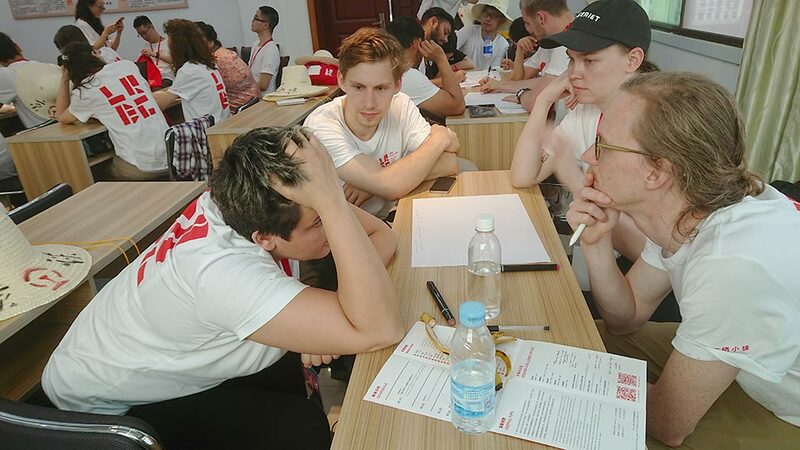 On the fourth day of the Challenge, all the teams moved forward towards brainstorming and ideation around the proposed solutions. On the other hand, some teams revisited particular villages to glean further information or impressions. 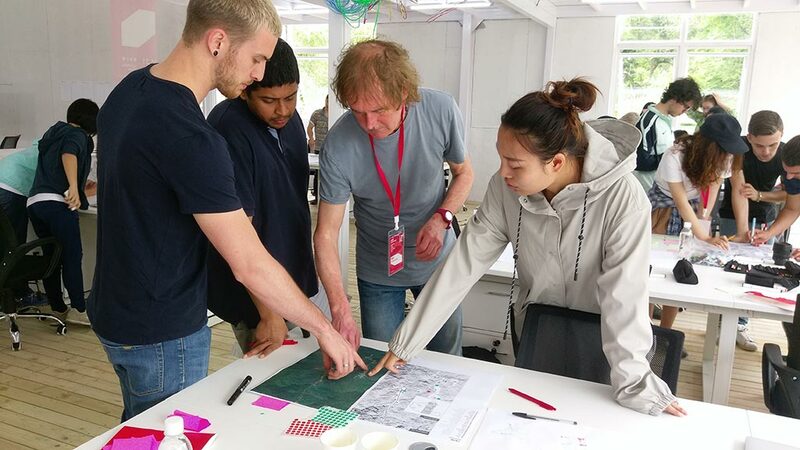 On the fifth day of the Design Challenge, the teams were fully focused on ideation, concept development, building and prototyping. 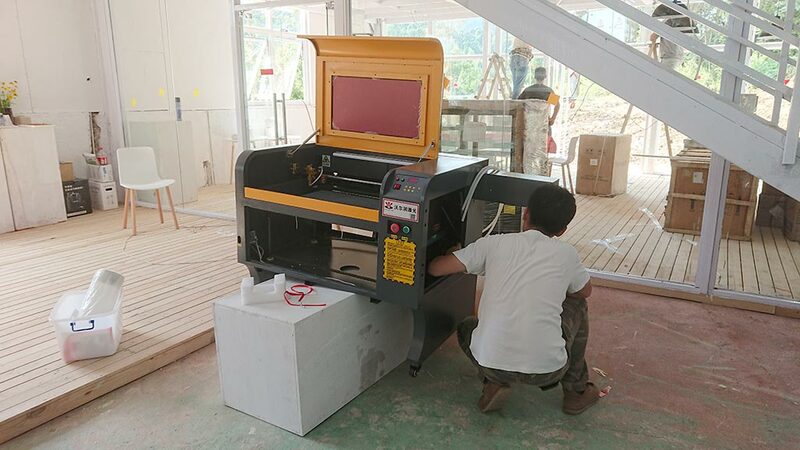 A full set of materials and equipment were available, including a 3D printer and laser cutter, which had been transported deep into the Chinese countryside. Several teams worked through the night from Friday to Saturday in order to have their presentations ready and exhibition pieces set up before 8am the following morning. Gao Yang -Associate Professor & Ph.D. of College of City Design, Director of Housing Product Design Department, Central Academy of Fine Arts, Architect. Janine Huizenga (Chairperson) – Head of the department of Interactive/Media/Design at the Royal Academy of Art in The Hague, The Netherlands, Designer. 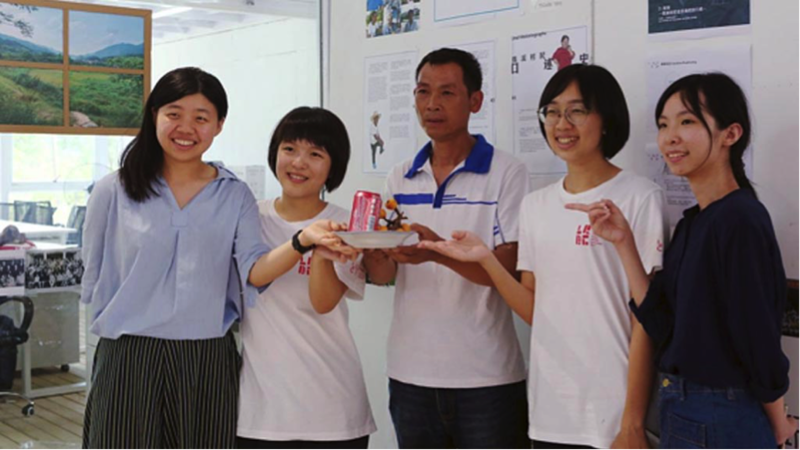 After the inspection of the exhibited work, the teams presented their individual design proposals. We grounded our expectations and preliminary vision on extensive preparatory work and research undertaken in months prior to challenge taking place. During our arrival and on-site field trips we amended and refined our approach, in accordance with local culture, environment and ecological risks, climate specifics, infrastructure and facilities, and economic potential. As a result, our idea of Lucitopia town and its potential came down to several core principles, which later on served as a keystone for our design proposal for rural community development. Our design proposal takes an holistic approach, bridging existing infrastructure into unified cooperation, establishing exchange-based, self-sustainable and eco-friendly lifestyle. In our project we envision Lucitopia as an aesthetic, genuine and environment-focused community. Preserving authenticity and style of villages is of paramount importance. Coexistence of community and environment is a core principle, according to which all other developments should be adjusted. 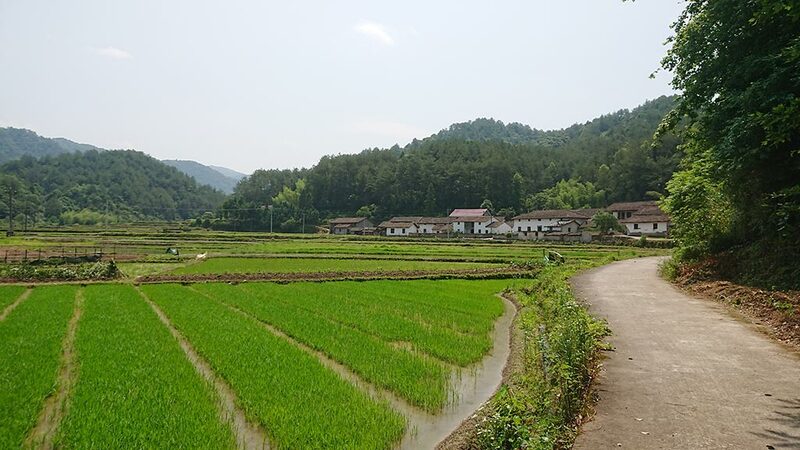 We view villages in Qingliangshan and their mode of living as key in creating a community that would serve two purposes – encourage local people to return and get involved in the revitalization process, as well as foster people from bigger cities to become regular visitors of the area. All urban development activities should be undertaken in such a manner, to ensure that neither local lifestyle nor the environment is disturbed or altered. It is essential that the local population receives due respect for their identity and mode of living and consider themselves as part of the change that is being planned for the area, and do not perceive this change as an external and enforced intrusion. During our on-site visits and research, it became evident that considerable infrastructure which would be needed for new a type of developed and eco-friendly community already exists on the spot. Therefore, we envision it as both rational and authentic to keep and give new purpose to all the buildings that are functional and safe, instead of building new ones. Such an approach would also enable the community to optimize use of financial and human resources and channel them into quality and scrupulous revitalization of local architecture and style. We explored numerous possibilities for inter-village cooperation, which would enhance social, cultural and economic ties between local villages and make the community more self-resilient and self-sufficient. Therefore, fostering goods and experience exchange are of primary importance to encourage local production and agricultural initiatives. Is it genuine? Is it practical? Is it attractive? Enhances and demonstrates local authentic crafts and arts, rural lifestyle and local production, making Lucitopia an important ethnographic and intangible cultural heritage hub. Financial income generated from a new type of small-scale production (herbs, dried fruits, local crafts, honey, water, etc); master-classes fees; fee for newly established cultural sites (no fee for local population). 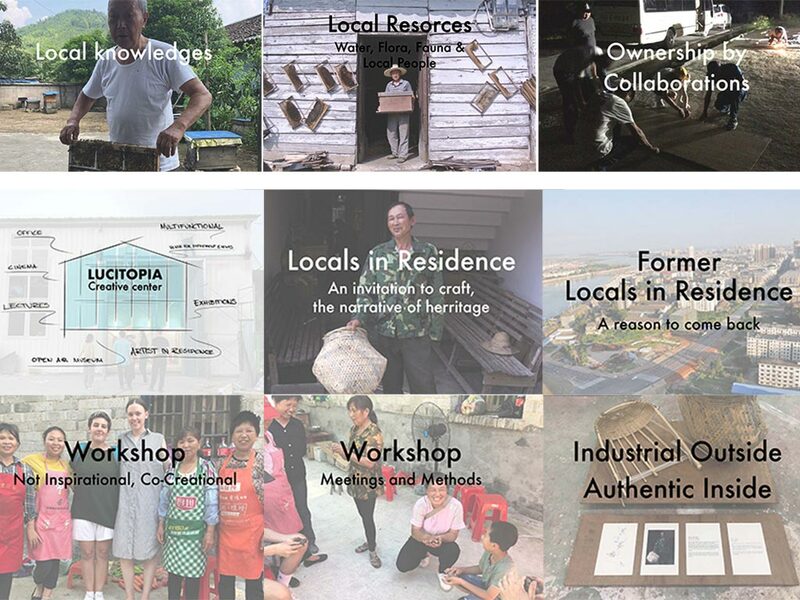 Lucitopia becomes new destination for MICE (meetings, incentives, conferences, exhibitions), thematic summer schools, ethnographic workshops, practical field-works for environmental research. Alternative space is created for community meetings/cultural interactions. The design method of the Swedish team focused around the narrative and heritage of the local people. Their proposal ‘Locals in Residence’ was built upon the idea of ownership by collaboration and working with the rebuilt structure of the central office and workspace to produce a multifunctional creative centre with a open air museum, exhibitions, lectures, a cinema and artists in residence. The centre would showcase the local resources – water, fauna, flora – and the ‘locals in residence’, their crafts and their heritage. This would also serve as a motivation for former ‘locals in residence’ to come back to the area. Co-creation workshops would also be held, displaying local methods and skills. The proposal of the Dutch team focused on the creation of a digital platform for beekeepers, which would be initiated by the government. At the moment, beekeepers generally rely on email or social media to sell their honey individually. 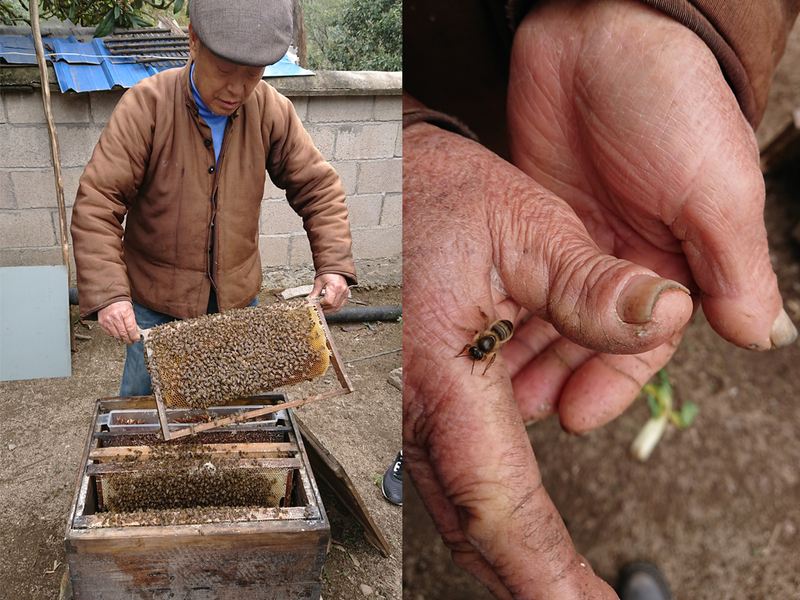 The Dutch solution sees the creation of Fán Zhen, a digital sales and distribution platform which would be initiated by the government to create a link and cooperation between ‘competing’ bee-keepers and promote their business. 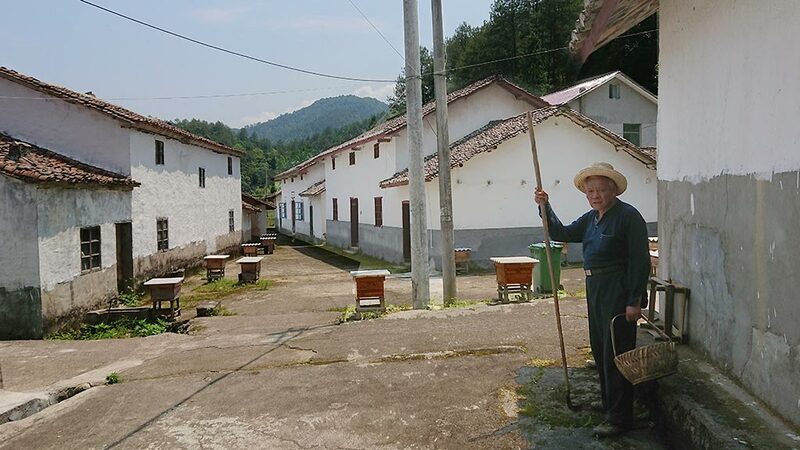 The platform would serve as a focal point for advertisement and sales of the honey, promoting also the beauty and authenticity of the area, and also provide sales statistics for the beekeepers, track orders and transactions, and display upcoming workshops to enable them to acquire new business skills. 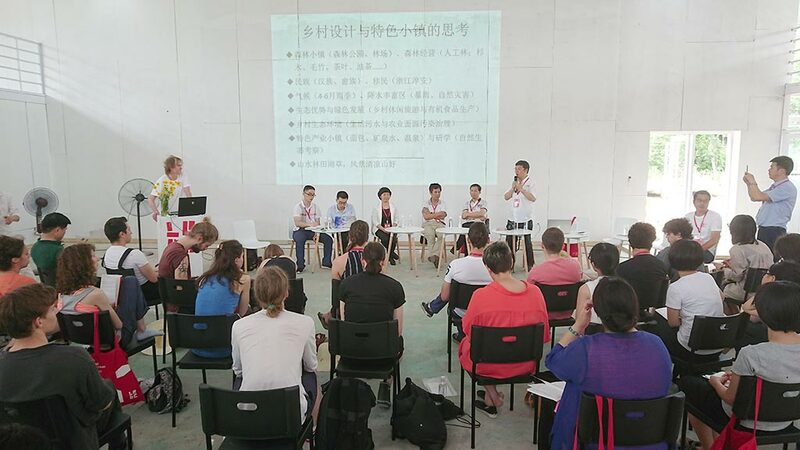 Additionally, the team proposed to introduce ‘wwoofing’ – a worldwide movement linking volunteers with organic farmers and growers to promote cultural and educational experiences based on trust and non-monetary exchange, thereby helping to build a sustainable, global community – to the Qingliangshan area. The first phase, Design, concerned the local area and people. 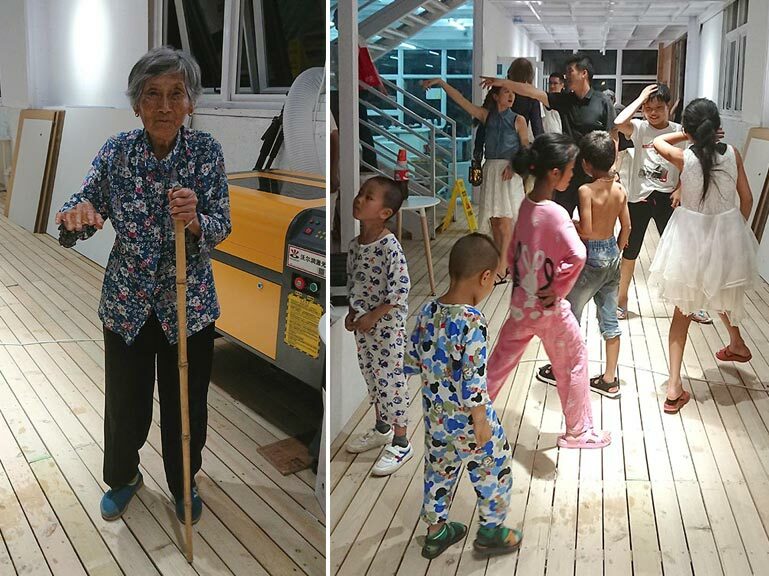 From their field work, they found, on the one hand, differences in the backgrounds and present situation between the original inhabitants and immigrants to Qingliangshan, and the officials and villagers, and, on the other hand, they found that the residents, in general, felt isolated and lacked confidence with regard to the outside world. These factors led to a lack of interest with regard to public issues such as the assets, needs and future of the area. They noticed that the villagers had many stories to tell as part of their history, but they could not appreciate their own value. 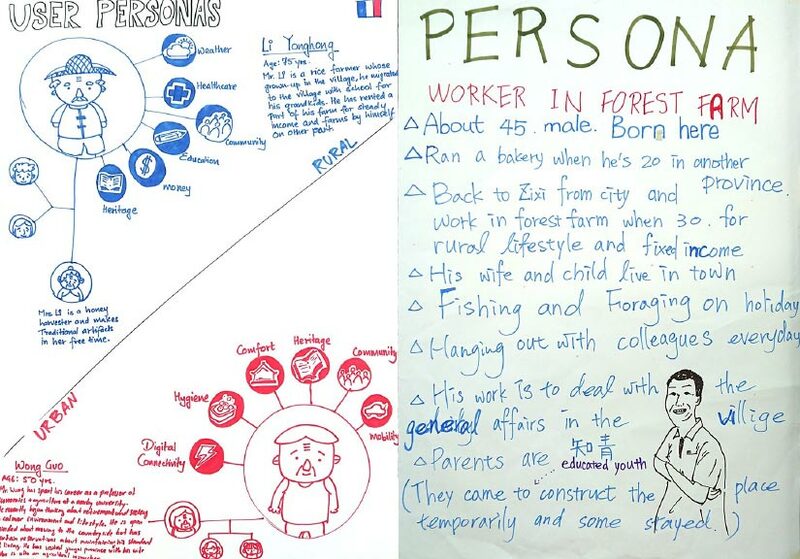 The team therefore devised a concept where the villagers would interact, share stories consciously, and find a common memory from their individual stories, leading to a better understanding of their shared narrative and importance, also with regard to public affairs and their shared community. 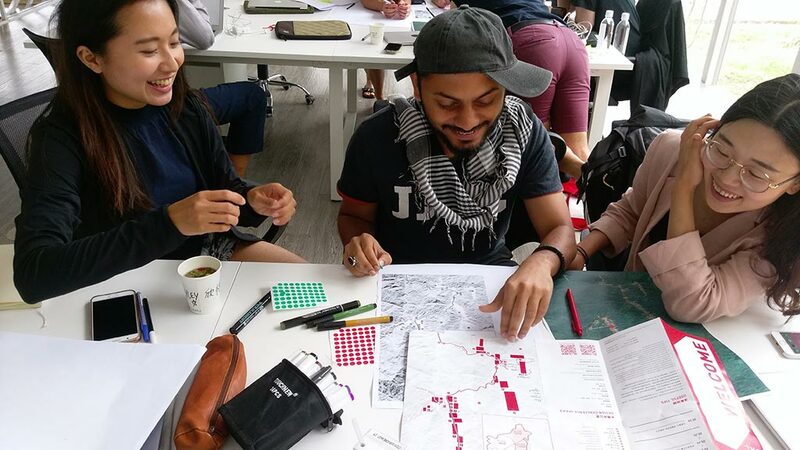 The concept thus aimed to help shape the identity of the area, and play an active role in the process of local development on a proactive and sustainable level. 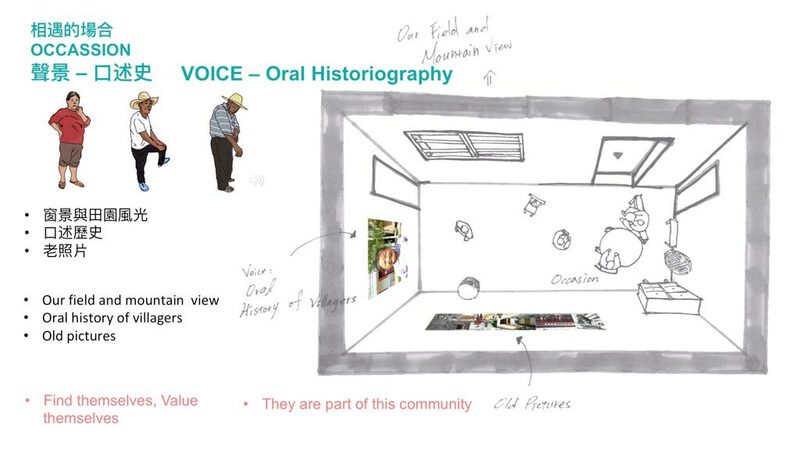 The second phase focused on Curation, action to let the villagers ‘see each other’. The concept was based on certain principles: The curation would be aimed at creating mutual consciousness, would be open to everyone and interact with everyday, personal life. In fact, curation would take place in the living rooms of houses in the villages, creating an occasion for encounter. 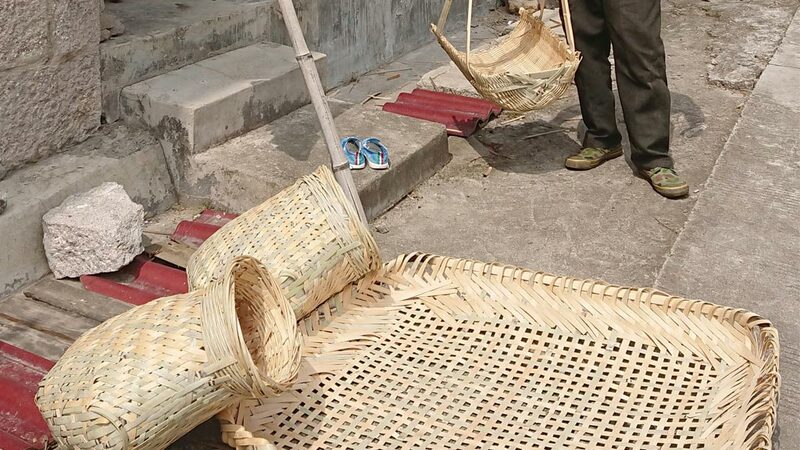 The contents of the curation would include oral historiography to rebuild the local life story, the lifetime process, featuring photos about history and culture, sorted by time, to ‘re-understand’ the position of the area on a wider historical basis, and events, when the villagers would come together to chat and drink. This would all help to ‘find themselves and their value’ as part of the community. Qingliangshan has a very complete environment. On the one hand, people here may be “poor” because they have fewer opportunities than the outside world. But on the other hand they are very “rich” because there are abundant resources and harmonious ecology. Although developing this place faces many challenges, reintegrating these resources will create many new possibilities. One of the most remarkable points is that the local people go out to make a living and leave a lot of unused houses, many of which are in good condition. If the previous owner no longer needs them, we could find new owners for them. Taking these conditions into account, we have a core objective, which is to make full use of local resources to improve the lives of residents. 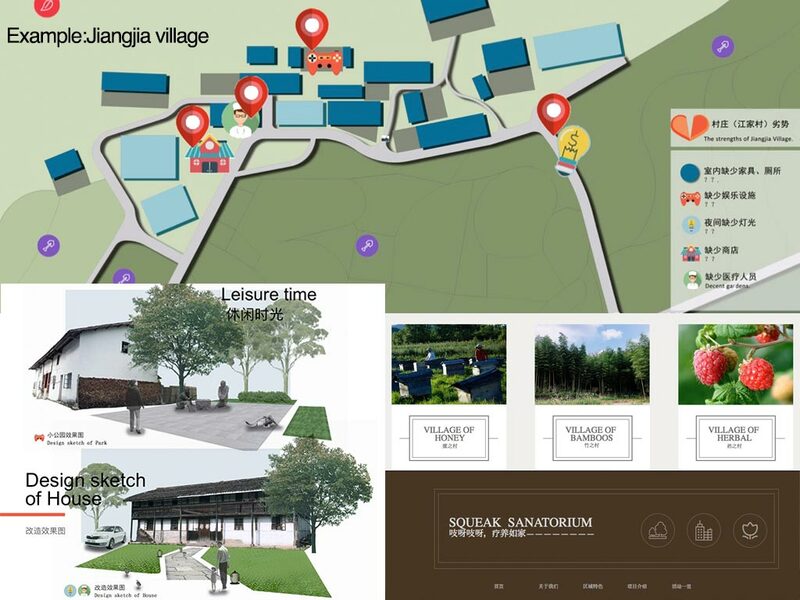 However, residents limited by the nature of the region find it difficult to achieve this goal, so we decided to set up a company as a medium to let local people conduct activities with the outside world, that is “Squeak Sanatorium”. “Squeak” comes from the sound of a wooden door being pushed open. We hope this company to be a entrance to the sanatorium for outsiders. Our main services include the following: first, collecting local empty houses, this is an important condition to be able to accept foreign customers. If home owners are willing to, houses will be handed over to “Squeak” for management. After the house has been acquired, the company will classify houses and retrofit them, the main reference conditions being geography, period of vacancy and the size of the house, then make a series of promotional activities according to the actual situation, thus achieving the result of attracting visitors. In the end, a series of publicity activities will be carried out to promote these activities, which are divided into seasons and themes. The function of the whole area is treatment and leisure. It might be for those patients who need treatment and may also be for those who feel tired of city life coming here to relax, these people are very likely to be the new owners of the houses. 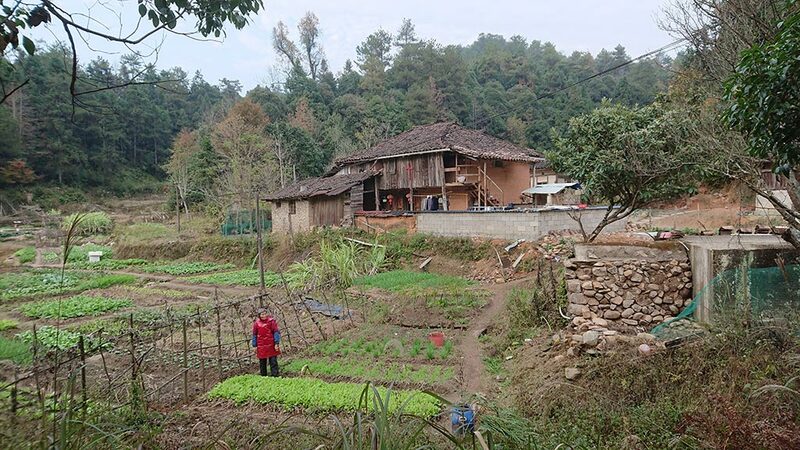 On this basis, we will find some of the main characteristics of each village, such as herbal medicine, bamboo, bees, etc., which will become other features besides the main themes of treatment and leisure. We will take Jiangjia village as an example. Its main content is bamboo. We will put information about rooms that can be open to guests on our website for those who want to come to relax. 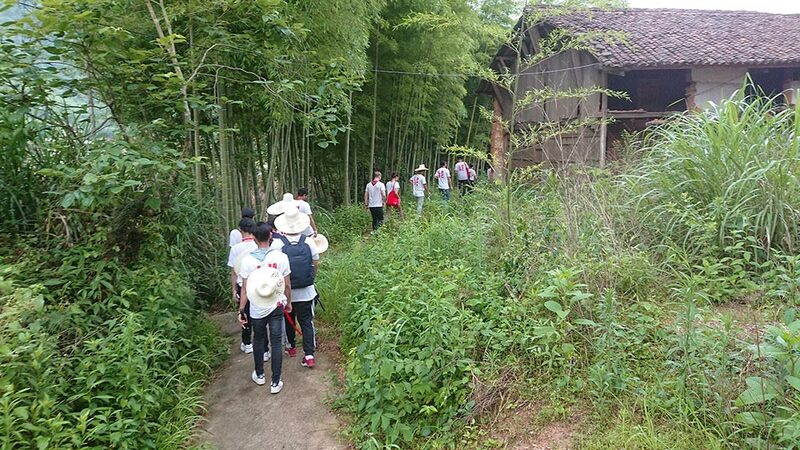 Besides, we will hold themed activities according to the different seasonal characteristics and room conditions, such as digging bamboo shoots in spring and cutting bamboo in winter. However, the number of empty houses is limited and the period of vacancy is different. This plays a role in controlling the number of outsiders and protecting the local environment. After the end of the activity, visitors could get some souvenirs or experience results, the most important thing is the feeling of living here. This achieves the effect of promotion and publicity. Their return visit and feedback will also be an important aspect of continuous progress here. Dynasties change, we believe that Qingliangshan will also have new life. 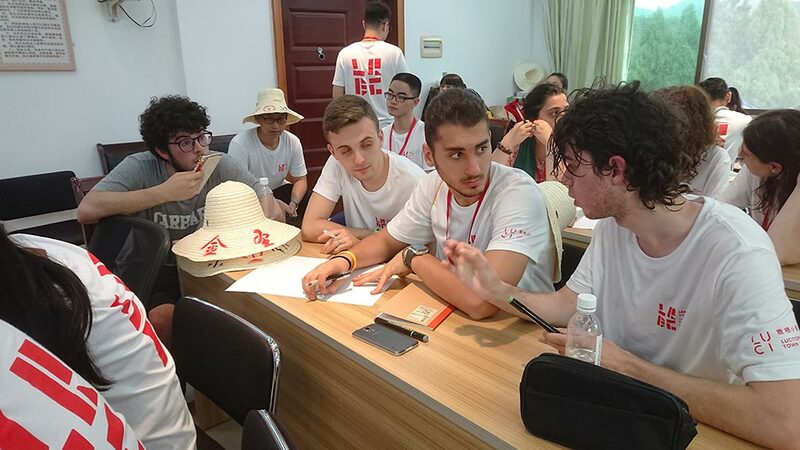 The idea of the Italian team is “Lucitopia’s brand”, which aims at requalification and revitalization of the Qingliangshan area, using local products and typical foods which are special to this territory. 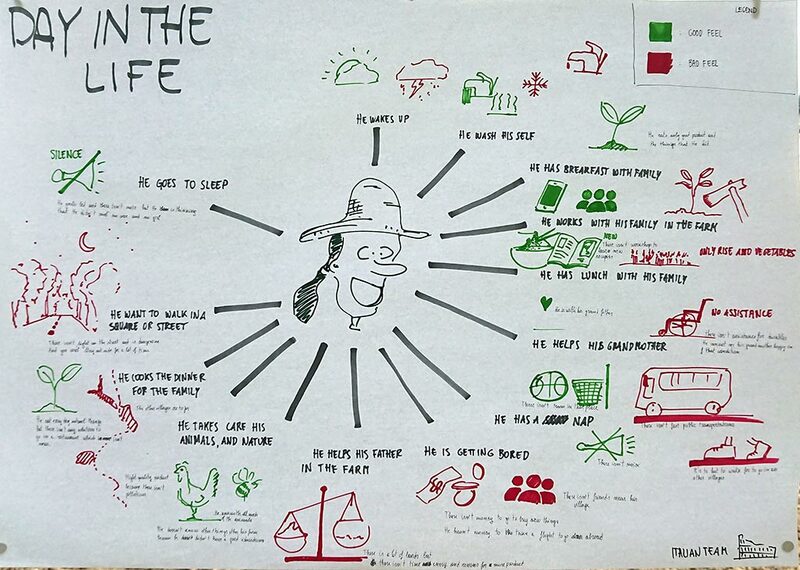 We visited the different places so that we could see people’s lifestyles in their context. 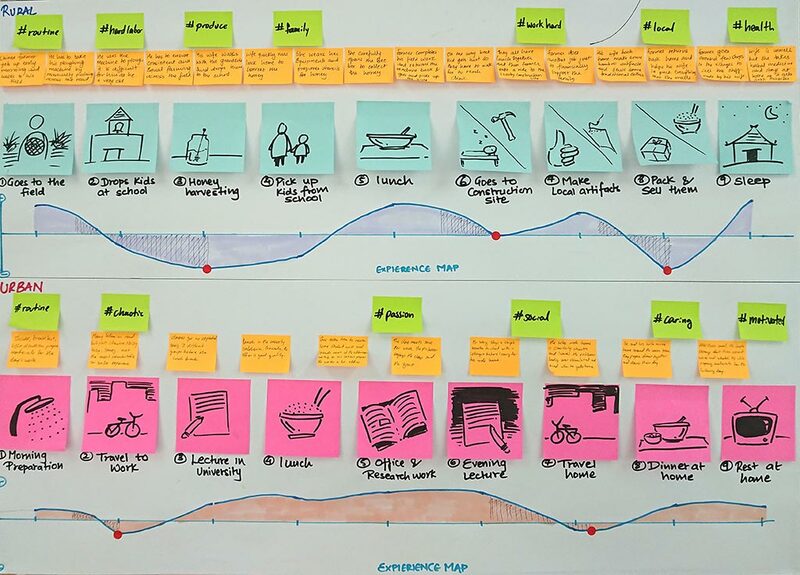 We analysed their problems, frustrations, and ambitions to understand what they need. One of their most urgent needs is the connection between this place and the other counties. They also need new opportunities to meet new people and new cultures. Another important problem is the number of young people, who leave this place to search for new opportunities to work, study and grow up. For this reason, the people there have not developed any economy. In the design process, we took into consideration an hypothetical guy who wants to go away from that place to find new opportunities. We examined how he should rethink his home from a new perspective. For this reason, we would like to bring out the highest quality products that the people produce there. With a typical Italian view, we thought of realizing a brand of local products, making a visual identity for them so that the people could sell these products such as tea, honey, rice, and bread in the other countries. Then we started to work on the tea and its packaging. We thought of a circular system, starting from the product, which will display a QR code technology on its packaging, and will end up with the people seeing the entire process of production. Furthermore, people may book a workshop to learn the craft and to make their own product. 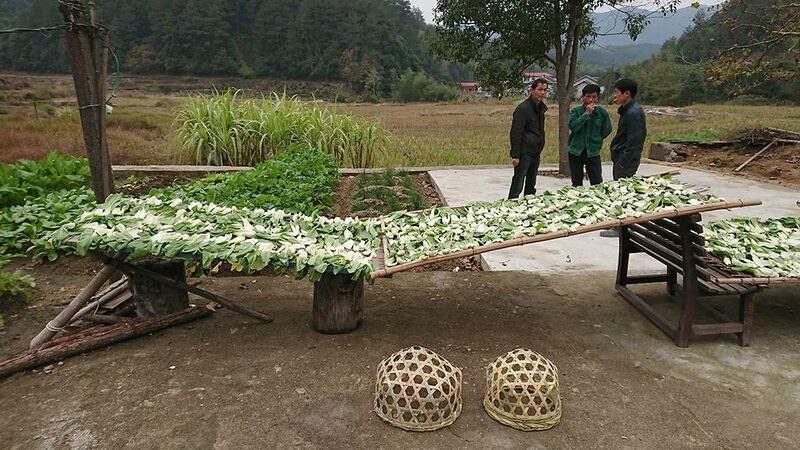 To do this, we created packaging for local tea with a hollow cutting from a bamboo plant. This is an idea for sustainable packaging to use natural and local materials. We also imagined doing this with the ripe bamboo, which is green, so that with time it becomes brown and we would like to use this transformation of the pack to communicate the due date of the food inside. We thought that by using this product Chinese people may get to know Zixi county, and so thanks to these people and the tourists the economy could increase and lead to a requalification of this area. LIXIWellness aims to achieve local economic revitalization and cultural promotion through the development of local wellness tourism through the use of local Zixi natural resources – herbs, knowing that Zixi not only has hot springs, waterfalls, white tea, but also the locals have a certain history in understanding and applying Chinese herbs. 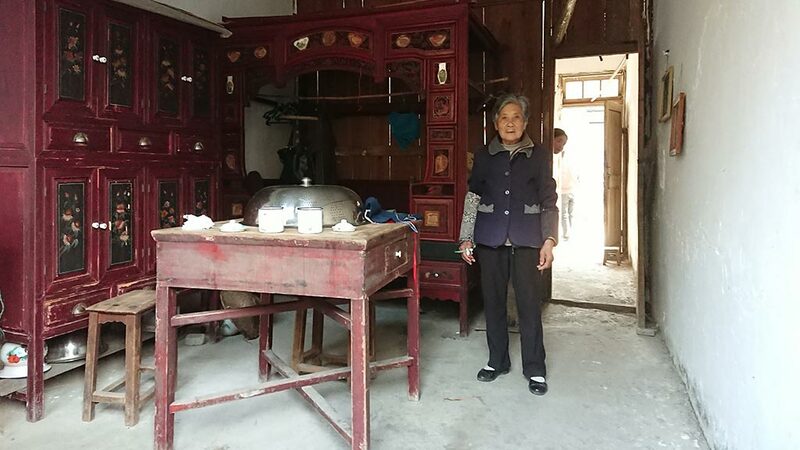 The project is created with the consideration of retaining the integrity of the environment while bringing more focus on the village’s authentic resources, Chinese herbs. 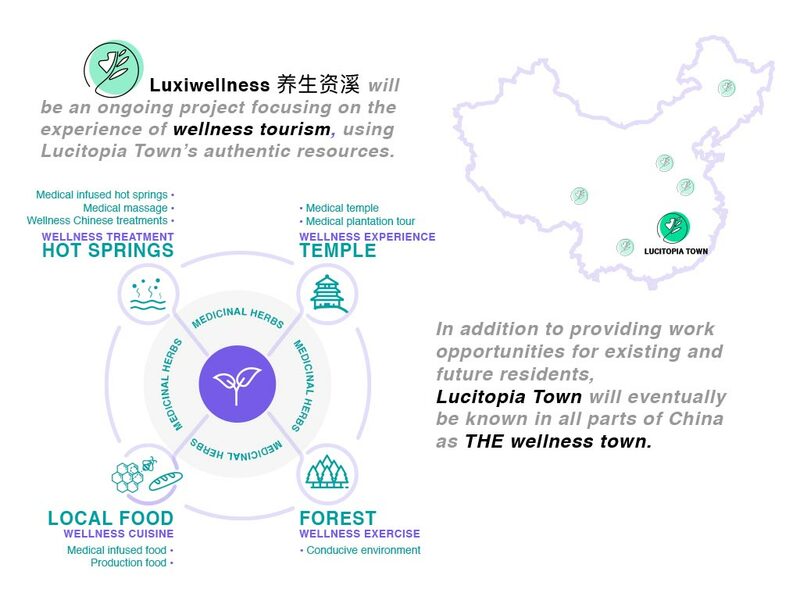 LUXIWellness mainly focuses on Chinese herbs in providing tourists the wholesome experience and personalized health tourism experiences in accordance to their individual wellness status. The wholesome experience can be felt through different wellness services in relation to the village’s environment – wellness treatment, wellness cuisine, wellness experience, wellness exercise. LUXIWellness not only provides wellness tourism services, but also provides a common platform for like-minded people, who focus on improving their wellness, to connect, communicate and learn. 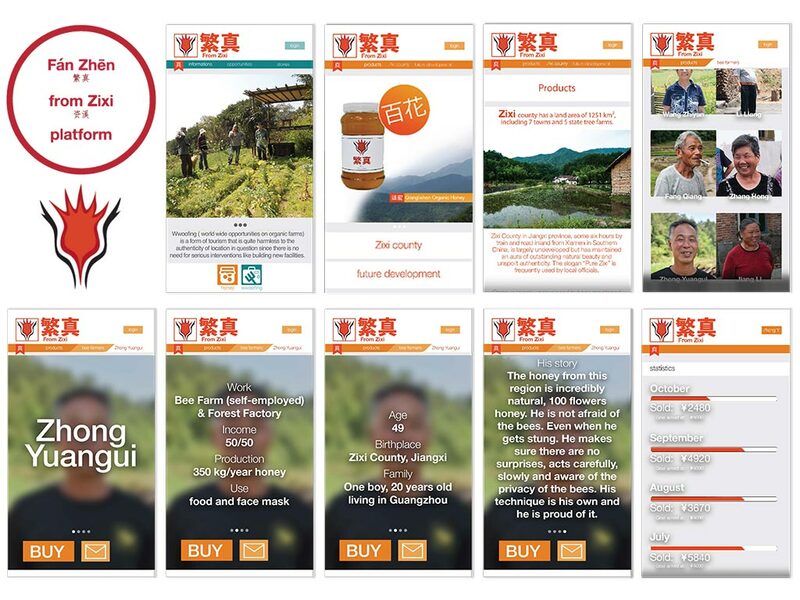 The project brings about the increase in popularity and economy through the sales of Chinese herbs and the development of specialty Chinese herb foods, at the same time, providing opportunities for Zixi’s young adults to return to their hometown. The establishment of the image of “wellness village” will serve as a cultural foundation for Zixi, and eventually become an irreplaceable core competitive feature for Zixi as compared to other villages. At the same time, it will encourage the sustainable development of Zixi and push forward in promoting Jiangxi as the pioneer leader of placing great significance on wellness. 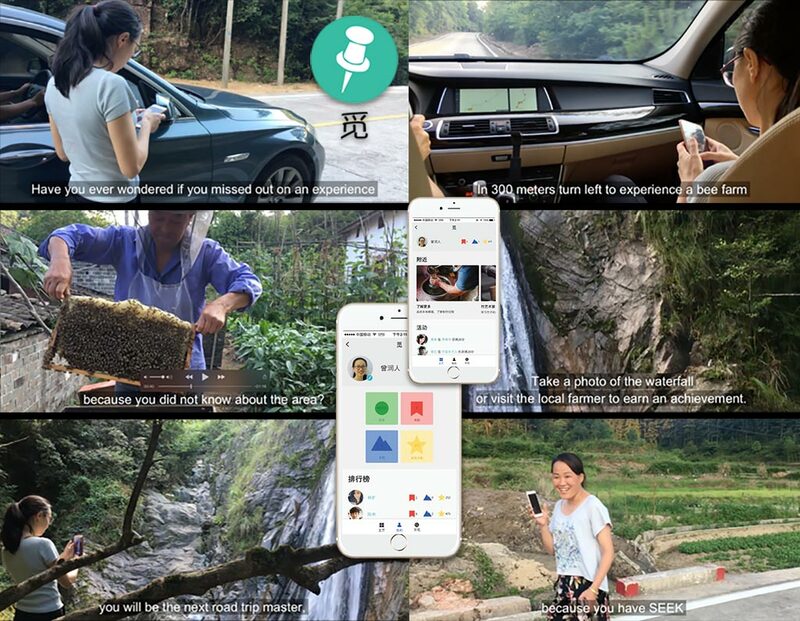 To expand business in Qingliangshan, and to counter a lack of consumers and online presence, we propose designing a WeChat Mini-Program named Seek, which uses gamification to attract domestic tourists to the area. Seek helps users plan a road-trip itinerary through notifying them of nearby landmarks and then rewarding them with points for visiting them. Additionally, the user’s friends are notified when someone in their network has visited a new destination, creating a country-wide competition within the app. Seek starts small by adding points of interest in Qingliangshan and rewards users for continuing to add new destinations to the map. Seek is scalable to all rural areas within China and even around the world. In this project we decided to begin the renewal of these beautiful villages by introducing a partnership between the public and private sectors in the hope of developing a more substantial culture of research and education. 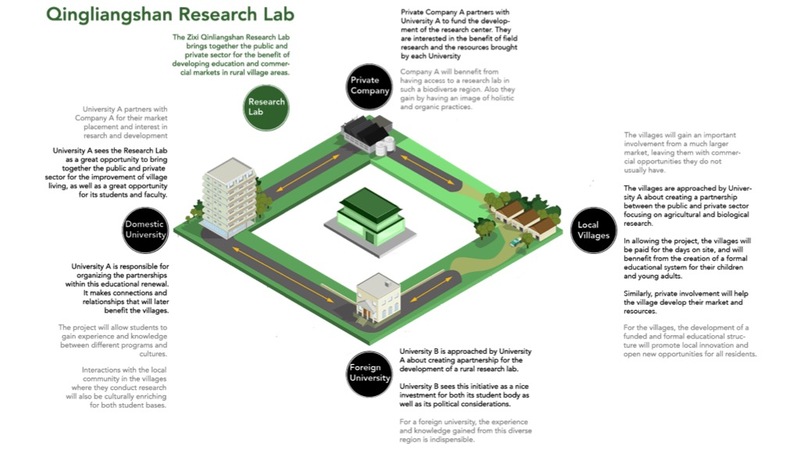 The Zixi Qinliangshan Research Lab joins the public and private sectors for educational and economic opportunity. In the interest of academic and market research we propose partnerships between a domestic and foreign universities with a local private company to develop and fund a series of research labs in the Qinliangshan forest park villages. The funding coming to the villages to support this privileged access would be used with mentorship from the universities in the development of local schools which will bring families back to the area. Assuming oversight will be managed by the local municipality, our proposal acts as a first step in the global renewal of this rich and diverse region. Following, the presentations of the teams, and evaluation of the jury, the Award and Closing ceremony took place. 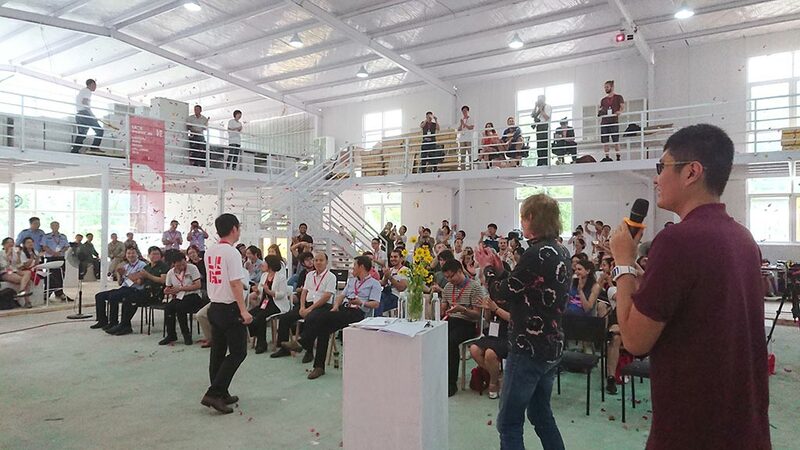 The Closing Ceremony ended with a speech by Mrs Ren Wenhua, the Vice Director of the People’s Congress of Zixi County, expressing the thanks and support of the local government, and an announcement by Gilian Wang of the planned opening of a Lucitopia Rural Design Centre and Rural Design Incubator at Qingliangshan. 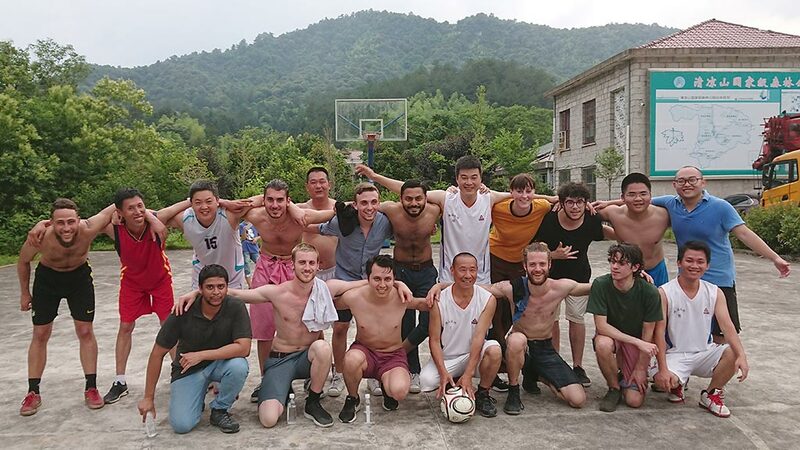 The day ended with a clear expression of the goodwill and warmth, which had developed between the LRDC participants and the local residents and Tree Farm Workers: The locals played against ‘The Rest of the World’ in keenly contested games of basketball and football before dinner and a subsequent DJ-animated party in the work-space, with particularly enthusiastic participation of the local youth and children. Thank you, Qinliangshan!